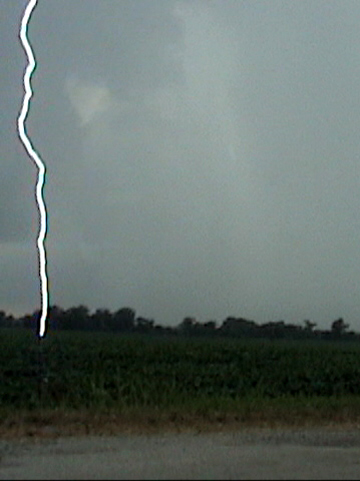 This bolt was only a couple hundred or so yards away. Note that it shows that lightning will not always strike the highest object in the general area - it didn't hit the trees behind it, and it didn't hit the powerlines along the side of the road where I was parked. Instead, it hit right in the middle of the field. NOTE: I got this video through a closed window, in order to remain safe from the lightning. In a car with the windows closed is one of the safest places you can be in a lightning storm. However, having the windows open significantly reduces this safety, so I kept mine shut and videotaped through the windows.